For years, people had been approaching Raul Malo and asking the same question: When are The Mavericks getting back together? Jump back 23 years earlier, when singer/songwriter Raul Malo joined forces with bassist Robert Reynolds, drummer Paul Deakin, and guitarist Eddie Perez to form the country/pop rock group The Mavericks. Malo and Reynolds met while attending school and discovered they had similar musical tastes. They both enjoyed the music of Roy Orbison, Patsy Cline, Elvis Presley, Hank Williams, and Johnny Cash. Taking the name the Mavericks, the band began playing rock clubs around the Miami, FL area and built up a solid local following. 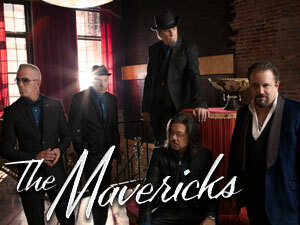 With music flavored by Latin rhythms and rock, punctuated by Malo’s soaring, romantic tenor, the Mavericks eventually made their way to Nashville and the country music scene. As time went on, the Mavericks began to rack up numerous Top 40 hits on the Country Singles charts, including “What a Crying Shame,” “O What a Thrill,” “There Goes My Heart,” “Here Comes the Rain,” and “All You Ever Do is Bring Me Down.” For their efforts, the group won a Grammy and multiple awards from the Country Music Association and the Academy of Country Music. And relevant again, they are. The Mavericks, with frontman Raul Malo leading the way, have a new single, “Born To Be Blue,” a five-song EP called “Suited Up and Ready,” and a new untitled album on the way in September.